Prior to using this technology, he said it took up to three or more hours to complete the same process, which now takes just over an hour. “This technology works 100 times more efficiently than I could have ever imagined,” he said. The original plan was to purchase Symach equipment for their fifth location in Wayne, located on what is referred to as “the mainline.” “This is the premier location for any business,” said Niestroy. 3D also purchased two additional properties adjacent to the Wayne location, totaling nearly two acres. The intention was to demolish the existing building and construct a new, state-of-the-art collision repair mega center. After six months of meetings and working with architects and engineers, they couldn’t get the shop approved to be built in that location. “After the setback with the Wayne project, I was still determined to make my dream a reality,” said Niestroy. “After scouring the area, and finding out where my insurance partners needed coverage, I located a building in Conshohocken, PA and our insurance partners all agreed this was the spot where they needed a partner,” said Niestroy. “The building was perfect. At 30,000 square feet, I knew I could build something so special and bigger than anyone else before me.” It took approximately six months to get the necessary approvals. “Over this course of time, my visions became clearer and clearer on how the building would be set up, how it would look, and how we would operate,” he said. 3D signed the lease in February 2016 and negotiated a deal with Symach to fit the space with the Italian-based company’s equipment and production model. Niestroy and two team members also traveled to Bologna, Italy, to visit the Symach factory and several of the facilities using the Symach System. During the week-long visit, they also met the founder and inventor of the new technology, Osvaldo Bergaglio. “It became so clear to me that this is the future of the collision repair business and if I didn’t adapt to this system, 3D would be out of business,” he said. “Granted, it could be many years before that happened, but once the world of the collision repair business got hold of this technology, we would no longer have the competitive advantage.” “By using our custom-designed Symach solution, 3D Conshohocken can yield a 50 percent increase in touch time, a 25 to 30 percent reduction in labor cost and market disrupting cycle times with superior quality,” said Chad Seelye, Symach’s vice president USA. Seelye said the new location in Conshohocken presented a few unique opportunities. For example, Symach installed the first SprayTron/ KombiTron solution in North America, which consists of one spray booth and one drying cabin that both utilize Symach’s DryTronic drying technology and robots. “When combined, it can produce average booth cycles of 30 minutes,” said Seeyle. “Using two painters and our unique Symach Application Process (SAP), a shop can produce 16 to 20 paint jobs of two to four plus panels per nine-hour shift.” As a comparison, he said to produce the same number of repairs in a conventional shop, it would take roughly four conventional paint booths and four painters. “This Symach solution requires 50 percent less production square footage and yields a 50 percent reduction in labor costs to produce the same number of units.” Symach also installed a FixStation solution. Seeyle said when combined with two combination technicians and the SAP, it can produce six to eight one-panel repairs per nine-hour shift. 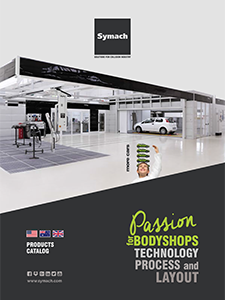 The FixStation is an all-in-one body repair/spray booth equipped with a FlyDry robot for curing paint and body filler, an in-ground lift and all power/air required to complete repairs,” said Seeyle. “The FixStation allows 3D to offer while-you-wait repairs, as the average one-panel repair only takes two hours.” In addition, the FixStation is oversized to accommodate taller commercial vehicles.